Follow the Writers In Tandem, David and Abby, as they go on adventures in search of the best places for food, vacation spots, and affordable deals. Getting my 13a Permanent Residency Visa! 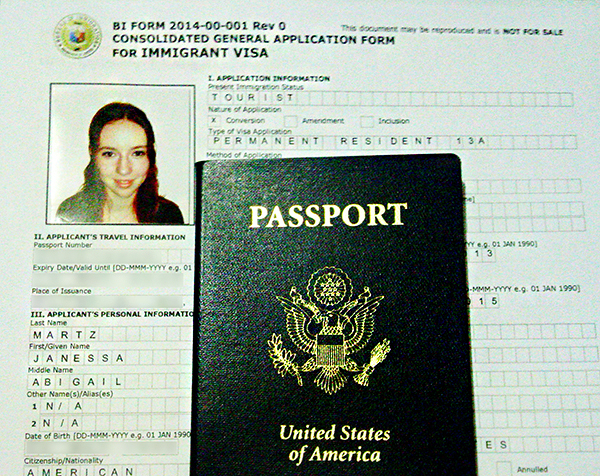 After two years of being a tourist in the beautiful Philippine Islands(August 23rd, 2015 will be my 2 year anniversary), I finally started the process of applying for my permanent residency. I thought I’d share my experience here as it’s been hard for me to find information on the process myself, so maybe my experience can help someone else who is about to go through it in the future. As of today, I have just finished the first step of the visa application. I will be updating this post as I finish each step, detailing the process. I am applying for my 13a residency visa, which is a non-quota visa by marriage conversion. I.E., you have to be married to a Filipino citizen to avail of this, which, obviously, I am! The marriage certificate is probably the one you will have to wait the longest for. It can take anywhere from 2-8 months after your wedding day for the NSO authenticated copy to be available. We used NSO Helpline to order ours about 3 months after our wedding. Fortunately, ours was already available at that time. We were married at Quezon City Hall in Manila; my understanding is that if you were married in the province it will take longer before your NSO marriage certificate is available. We also ordered David’s birth certificate from NSO Helpline at the same time we ordered our marriage certificate. I don’t remember exactly what the documents cost, I believe it was between 300-500php for each, so around 1k for both. It’s a lot cheaper(at least half, I think) if you just go to NSO and order them in person, but that requires a lot of time spent queuing and we figured a couple hundred pesos extra was worth the hassle-free ordering. We received the documents delivered to our door within a few days of placing the order and paying for them. Now, most Filipinos are familiar already with the horror of acquiring one’s NBI clearance. After keeping my husband company while he applied for his before, I was REALLY not looking forward to going for mine. I was expecting to spend almost the entire day waiting in line, being herded like cattle. However, I was pleasantly surprised. Getting one’s NBI clearance is one of the rare circumstances in the Philippines where it is actually advantageous to be a foreigner, because us foreigners have a separate queue and don’t have to wait with the hundreds of locals applying for it for their job requirements and what not. When I went for my NBI clearance, I had mixed answers about where to do it. I read from some sources that foreigners HAVE to apply at the main branch. Other sources said that wasn’t true. I decided to play it safe and we went ahead and applied at the main branch on United Nations Avenue in Manila. The drive there was longer than the process, we were only there for about 30 minutes. Just make sure to apply online via their website first, as online pre-registration is a requirement. You can also choose to pay ahead of time instead of paying there, which will save you some queuing time. Print your online registration and proof of payment to present at NBI. All you need to bring, additionally, is your passport and maybe an extra ID just to be safe. You’ll need photocopies of your passport’s bio page and all relevant visa stamps. They have a copier at NBI that you can avail of if you don’t do it ahead of time. The people at NBI were very friendly and helpful, so there’s no need to stress about getting it done. Just fill out the form they give you, walk back and forth to get fingerprints and etc. done, and you’ll be out in half an hour. You will be told to come back after 3 business days to pick up your clearance, and that will really just be a walk in-walk out process. Those are the hardest documents to acquire. Beyond that, you just need a joint letter from you and your spouse requesting the visa, and photocopies of your passport pages(if you’ve been extending your tourist visa already, you know the drill there). 2nd Floor, Bureau of Immigration Bldg. May I respectfully request a non-quota immigrant visa under Section 13, paragraph A of the Philippine Immigration Act as amended, in favor of my foreign spouse, Janessa Abigail Martz, an American national. I am David Christopher Mesias Hizon, a Philippine citizen. We were married in Quezon City Hall on January 8th, 2015. The last of the requirements is 2 copies of the CGAF, or application form. You *can* print it out and fill it out at home, which I did, but when we went to apply, they had an updated form and I had to re-fill it out there, so you might as well just do it there in the first place. You will also need 2 photos of yourself, one for each form, the same photo requirements that the Bureau of Immigration requires for tourist extensions; 2×2″ white background. Okay, that’s all the paperwork! Make sure to also print out the checklist of requirements. You will need to purchase two legal-sized 8.5″ x 14″ folders to compile the paper work in. We got ours at National Bookstore for 5php each. The reason you need 2 of certain things is because you will be filing one application for the visa itself, and the other application will be for the ACR-I card. Once you have everything compiled and signed, it’s time to proceed to the Bureau of Immigration(side point – no shorts or slippers allowed; it’s a government office so dress appropriately). As with the NBI clearance, we weren’t sure if it HAD to be done at the main branch or not, so we played it safe and did. The main branch is in Intramuros. We arrived, parked our motorcycle at the Starbucks across the street, and entered. You will have to leave one ID at the entrance. Once you enter, directly to the right will be a table where you will have your documents quickly checked over. This is where I was informed that the applications I had printed off of their website were outdated, and they gave me two new application forms to fill out. I filled them out, returned to the table, and after checking the documents over once again, they directed us to our next counter. From here, it’s super straightforward. There’s a bit of running around between the ground floor and the 4th floor, but nothing to worry about; each time you finish with one person, you will be told where to go next. It’s just a bunch of officers signing off on your different documents and verifying the completeness and accuracy of everything. Once everything has been verified, they will keep your application forms and direct you to payment. The fees add up to a total of 10,930php. It seems like a lot, but all the fees are included already, including your ACR-I card fees and the visa implementation fee. You will be given a receipt and on the receipt will be your interview time and date. You will have two options – for us, we could choose between Thursday, August 20th, 8am, or Tuesday, August 25th, 8am. You don’t have to commit to either right then and there; either date you choose is acceptable. So, if you miss the first date and time, you can still come back on the second date offered to you. Just be sure not to miss your appointment the second time, or you will have to start the process all over again and pay the fees again as well. It’s extremely important that you’re not late for the interview. We will be going back for our interview on Thursday. From our understanding, it’s a really short and easy interview, it’s just basically to prove that your spouse exists. Rumor has it that it takes about 10 minutes. I’ll be updating this post afterwards to confirm and share my experience! We just had our interview this morning! It seemed to go well, it was really simple and quick but I’ll detail it for those that are nervous, like I was. We showed up at our designated time. There’s a sign up sheet outside the interview room; be sure to show up early so you can get done early as there will be several interviewees assigned to every time slot and it will be a first come, first served basis. David and I showed up really early, our interview wasn’t until 8 but we were in Intramuros by 7, anticipating traffic that wasn’t there for once. It turned out that the BofI in Intramuros opens at 7am(every morning except Monday, when they open at 8:30am, we were told) so we went in and waited by the interview room. We were the first ones there, so we were the first ones interviewed as well. Be sure to bring your Official Receipt and Passport, and the Filipino spouse needs to have an ID to prove his identity as well. The interview was pretty informal, we just stood up behind a counter and the interviewer asked us just basic questions; when and where we met, our wedding date, simple stuff. The most important part is financial information, to prove that we can support each other. The interviewer asked if either or both of us were employed and how much we made, as well as if we receive financial support from anyone else. We’d actually brought a copy of David’s employment contract as proof of financial capacity and I offered to give it to him, but he said they didn’t need it, he just needed us to tell him verbally. That’s all there was to it. The interviewer said everything sounded good, and that things looked good for us 🙂 He then directed us to the next window where I got my biometrics(fingerprints, signature, and photo) taken for my ACR I-card. We were done! The interview itself was only about 10 minutes, the biometrics took another 5 or 10, and we were out of there before 9am. Easy, fast, and painless! Now, the hardest parts are all done, and they weren’t that hard at all! We were given an estimated date of implementation for my visa, about a month from now, and told to check the Bureau of Immigration website around that date to see the status of my visa application. Once it’s approved, we just have to go back once again for my passport to be stamped, and then another trip a week or two later to pick up my ACR I-card once it’s ready. So, that’s it for now, I’ll update again in a month when I(hopefully!) go back to have my passport stamped! Sorry for updating so late, but I’ve been a bit busy and have been lazy about getting back to this post. It’s been several months now since I had the visa implemented, but will try to remember as many details as I can. The last trip to Intramuros was super easy, just cost a bit of time. Just go to the counter that you’re directed to(first floor, I believe it was the first or second window, all the way on the left). Just hand over the official receipt from your first visit when you started the application, and you also need to bring the official receipt for your latest tourist visa extension. I didn’t know that I needed the OR from my latest tourist visa extension and didn’t have it with me, unfortunately, so I had to go upstairs and ask them to print it on the 4th floor. Not a big deal, there was no hassle involved, just wasted about 30 minutes of our time waiting on that to be done. After we had our OR printed, hubby and I went back down to the first counter again, gave them the ORs and my passport, and then it was just a waiting game. They’ll tell you to come back to the window in half an hour, then hand you your paperwork to take to the next window. After the 30 minutes is up and you’ve gone to the second step, it’s just the same thing; give them the paperwork, wait, they’ll tell you to come back later. We were told it would be a two hour wait, so we went across the street and sat in Starbucks for a while. We came back about 20 minutes before I was supposed to, and they saw me sitting there and called me over early. They handed me my documents, my stamped passport, and my ACR I-Card as well, and that was it! I was out of there! I was super pleased to note that I had been given my ACR card on this trip; I was under the impression that I would have to come back a fourth time in a couple of weeks just to pick that up, but was happily proven wrong. Maybe I just got lucky though, so don’t count on not having to come back one last time. The trip was super easy, just a bit time consuming, but there was absolutely no hassle or trouble at all, and we were out of there just after 12nn. Now, I just have to return in July(two months before my probationary 13a expires) and petition for it to be made permanent. I haven’t managed to get any information from anyone who has done that part yet, but my understanding is that it will basically be the same process and same fees a second time, although one of the BI officers told me it would be faster. I guess we will see in July, I’ll post another update then! Hi. Just wondering if you did the annual report while you have the probationary visa? Is it required? If so, what should be in it? Thank you. Yes, it’s has to be done every January including during the probationary period. The first time you go you need to fill out a form online at https://vua.immigration.gov.ph/registration.aspx. you will get a confirmation number and should print out the first page to bring with you as well as your passport and ACR card. At the Bureau of Immigration office they will collect P310 and you are finished. Thank you for the info, very helpful! I wish BI would inform applicants upon issuance of the ACR I-card and/or probationary visa. Yes you have too. I didn’t and even though I was at the office in January doing my permanent final approval Noone told me and I was fined when I went back to get my card. Thank you for sharing your experience, very helpful! How much is the fine? If you married to a Filipino/American Citizen you get a 1 year balikbayan visa when you arrive and you are exempt from the annual report or submitting any visa. That’s only true if your Filipino spouse arrives with you and you present yourselves together to the immigration officer. If you ever have to travel on your own and return without your spouse then you will only get the standard visit stamp. That used to be three weeks for an American but I think they might have increased it to 30 days. Thought I’d share this: So I got the probationary visa in Jan 2017 and just to make sure I’m not missing anything, I called the BI office and I was told no need to report this year (makes sense). Deadline btw is sometime next month. I would need to report Jan next year. You may call the BI Annual Report Unit at tel. 465-2400 loc. 208 for inquiries. Good point. I should have mentioned I got my provisional visa in April 2016. I did the annual report this January 2017. I’m now in the process of converting my visa to permanent. They did ask me for my OR (official receipt) from the annual report. Hi may I know what are the complete requirements in converting to permanent? How long does it take for them to process and to get your new ACR? I check the website and it seems like its almost the same as the 13a probationary requirements. I’m still in te process of doing mine and I have help from an agency. As I understand it, the process is almost exactly the same except I don’t need a police clearance from my home country this time. But better don’t take my word for it because as I said, I have an agency helping me so I didn’t prepare everything myself and I haven’t received my permanent yet. Hi!can i know the name of the agency and where is it located?how much did u pay the agency? And i want to ask also if they also get your fingerprint or photo? I used an agency called 583 Immigration and Travel Consultancy. You can find their contact information at the bottom of this page – https://583travel.com/ I used the main office in Angeles but they have offices in Subic and Manila too. I’d rather not say how much I paid because my case was complicated as I had to travel. You can get a quotation from them for your particular case. I did need an NBI clearance again and for that I needed to be fingerprinted and photographed. The agency came with me to take care of that so I didn’t need to worry about where to go or what to do. good information all about, I am going to start my process soon. How long can we stay out of the country once we apply for TRV? I am a seaman applyinv for 13A. How long can we stay out of the country once i get my TRV? Thanks for all useful information. I still want to ask that can I leave Philippines during my appliction in processing ? Hi Me and my fiance will be getting married here in PH, he is Brazilian that does need visa to enter PH for 59 Days, how ever can he work here in PH while we process the PR Visa for him? If so, do you know the procedure? i would like to know how long your PR Visa before it was released? Hi Ivy, having just been through the process, just try to show any assets abroad or in the Phils, savings accounts and income. Anything to demonstrate assets and money. There is no set amount, they really just want to see something is there. Of course there is the assumption that if your husband is a foreigner that he will have money. I would also strongly advise you to apply for the permanent residency abroad. I did so, I received my single entry visa with temp permanent residency. All it took was one trip to Immigration in Manila and 3 weeks later I went back and picked up my ID with my Permanent Residency. Not temp but permanent. If you apply within in the Phils you will need to repeat the process after 12 months to go from temp to permanent. Wow! I sure wish I had known it was better to apply from outside the Philippines. Due to mistakes by the agency I used, it took me 19 months from the time I started just to get my temporary 13A. I changed agencies. Now after a year I’m in the process of converting to permanent. Actually I started the process while I was still living outside the Philippines but shortly before I moved here. How long did it take for your initial single entry visa to be processed? Did you use an agency in the foreign country or do everything yourself? Speaking to the financial aspect, I honestly can’t remember any questions at all about my finances or bank accounts. I certainly didn’t show any bank statements. Just to be clear. I was applying for a permanent visa outside of the Philippines, due to my spouse being a Filipina. So I applied and received my temporary single entry permanent residency from Sydney Australia. If I had applied in Manila I would have a got a one year temp permanent residenct visa. So to answer your question, no I avoided using an agency partly because there was no point and party because I was warned of scams. It wasn’t that hard, I just made sure I triple checked I had every document they wanted, every form. Actually I made sure I had more than they wanted. Whenever I deal with any kind of Filo beaurocracy, whethere government or bank etc, I take a file with all my ID documents right down to rental lease. It’s amazing how many times they ask for something that wasn’t listed on their requirements and having all my docs with me saves loads of time having to go home, find them, return and then have to queue all over again., It took me around 2 weeks I to get my visa at the Sydney Consulate. In fairness I should say mistakes by the agency and related delays, including the post office here in the Philippines losing a letter I mailed to the police department in the US. But I’ll consider the agency not informing me I should complete the process from outside the Philippines another big mistake. Hello, Howard could you also tell me what are the documents you needed for the 13A Visa? I’m presently out in Philippines and thinking to apply before getting there on February. Ho Jovelyn. I would definitely recommend getting your 13A prior to coming. It is a lot of work nonetheless. You need to go to the website of the Philippine Embassy in whatever country you are in and download the 13A forms. They will have a complete list of everything that is required. Make sure you get every document. When go to the Embassy/Consulate bring every document with you and even extra stuff that you think of. It’s better to have too much than too little – always when dealing with the famous Filipino beaurocracy. By doing it before arriving you will save a big headache in the long run. It is very time consuming and frustrating to do it here. By doing it prior to leaving you will not have the one year probation period, the end of which you have to repeat the process again. Shortly after arriving I had my permanent residency and no probation period-all because I applied outside the country. Really really worth the effort. Hi Howard and Michelle. I am planning on applying for my husband’s 13A visa either here or when we move to the Philippines this year. I want to know which consulate younsent your documents to and how long it took for the decision of your residency. I am trying to plan things ahead as I really hate doing paperworks in the Philippines. Thank you. Hi. After granted a probationary visa, which will expire by January, I just known that we need to relocate to Europe by January! Now I am thinking if I should proceed with converting it to Permanent (for we don’t know if we need to live in the Philippines again in the future). Would anyone here knows if it is allowed to apply for Permanent but actually I will not live here (at least maybe in the next few years)? I don’t mind paying the Php10,9++ again to obtain Permanent visa, report every January and pay ECC since I will be in and out of the Philippines for work. Thank you. This is very helpful. We are on the process of trv by marriage. I hope this process is as smooth as your, to think that we came all the way from province. It is true thay they are getting same documents here and there, and they sometimes mislead and misinformed you. The problem when we had downgrade, shouod have been just 2-3weeks, but it took us 1month and more, they didnt inform us of the delay. I am Filipino, and its really hard especially if u are not willing to learn the process over the internet. Also, on our experience, please beware of offers saying they help u make it faster and sure approval by giving some money. Do not fall on that. If you think there is something wrong, you can always call 8888 for complains. Its really responsive, we just did and was shocked when they have known the complain before we went there to follow uo again. This is very helpful site. I applied for TRV by marriage for 1 year (Probationary). I have to apply for extension of the TRV for 2 years. I would like to know if after I get my extension, when would I be able to apply for Permanent Resident, On my ACR, it mention now as Probationary Resident. I tried to apply for 13a but since my Citizen is restricted or not applicable to apply to that even that I am married to Filipina. I read somewhere that you can only be under TRV for 5 years in total. As I am planning to stay, it seems frustrating process, as you ask you get different information each time. Hi mhasouna. Any update on your permanent residency? My husband maybe of same case. (Bangladeshi national) Although we have not started the process yet. Are u staying in Phils or abroad? Philippine Consulate here in Dubai have stopped issuing Multiple Entry Visa which is a lot hassle for us since he goes to Phils more frequently than i do. We were advised here to apply for 13A visa when we get to Phils. I want to know how many days we need to stay as we are coming for a 1week vacation only. #7 requirement, BI clearance certificate. Where shall we get this? Anymore tips? Thanks a lot! Hi Almira, If you are traveling for a week, it is not enough. You need at least 1 month, as in our case it took for about a month between interview and waiting for the visa to be ready to collect. I had to travel back to UAE, so we got the visa on the last day of travel but the I-card was not ready. We had to push a lot and see where it was pending. I ended up traveling outside without my I-Card, but i had to pay extra to travel without I-card and when I went back again.. I collected the I-card. I have dropped my application as because of my citzenship I can not obtain 13A, it has to be only TRV, so I could not be a Filipino citizen even though I am married to Filipina. I do not need to bore you with the details. But you mentioned that he travels a lot more than you. I do not advice you, as far my knowledge to get him TRV or 13A. We asked a lot but not one knows much and each person tells a different thing. Welcome to Philippines :). The reason I said that, the TRV/13A is meant to be inside Philippines. Once you travel abroad alot, you will have to pay the cashier about 3000 PHP or so each time you leave the Philippines. We tried to consult a lawyer, but that lawyer had less information than we had. I wish you the best for your and your husband. If you have any question, I will try my best to answer as far my knowledge. I believe that I can not get a Filipino Citizen since our country has no mutual diplomatic relation with Philippines. #7 BI Clearance, you can go with your husband NBI Main Office in UN Station. It would take about a week since it is first time. You can accompany him. I believe the second you may get it quicker and from remote NBI offices (As I was informed, I did not try it though yet). Hi Kris, yes my application was successful. No need to be helpless! If you applied and submitted all the required applications, then you will be fine. Hi Almira, about my TRV residency, it has been expired already since I had to move back to Dubai. I am abroad currently. I believe that I have to start the application from scratch! You are correct. I asked last month and they said I can apply only single entry. I hope they would have that changed pretty soon. About going to Philippines, if he travels frequently there will be a fee that he may need to pay every time he exits. I was just surprised, since I was on TRV it would be higher than the tourist pay. But on the positive side it will remove the hassle of re-applying for single entry each time. I am afraid that one week is not enough. It will surely take you more than that. I would say about 30 days at least. I read some have it less than that. It is about location you will apply as well that matters. The reason is that I had to wait for schedule, then waiting for the visa to be issued and the ACR-I card. In my experience, I could not wait for that, I had to request a letter to leave and come back to Dubai as I was out of time. Feel free to ask me and I will try my best to answer. I am going to reapply again btw. Ohh sorry almost forgot; #7 the same place you get your NBI Clearance (Main Branch). It will take time to be issued, but since you are with your husband, you dont have to wait in the long line. So faster for foreigners, which I liked that. Hi Ronald. Thank you for your reply. I have other questions regarding the requirements. I hope you can help me. 1. Joint letter request addressed to the Commissioner from the applicant and the petitioning Filipino spouse. – This letter needs to be notarized right? 2. Joint affidavit of continuous cohabitation of the applicant and the petitioning spouse. – Is it true that an attorney should do this for us? Or I can make my own and just have it notarized as well? 3. BI Clearance Certificate. – Is this will be given at the immigration office when we apply? Thank you in advance. God Bless! Hi Irene. Did you successfully underwent the process of conversion to permanent? If yes, can I ask the following please? (2) Regarding BI Clearance Certificate – this will be given at the immigration office at the time of application, right? Hello! Is there an age limit to living in the Philippines under the 13a? I am 32 y/o and me and my wife, she’s a Filipina, are planning to live in the Philippines. She came here in the US through the K1 visa. Hi. After granted a probationary visa, which will expire by January 2018, now we relocated to Europe due to work! Despite that, I am thinking to proceed with converting it to Permanent for we don’t know if we need to live in the Philippines again in the future. Would anyone here knows if it is allowed to apply for Permanent OUTSIDE OF THE PHILIPPINES instead of in Manila? And what would be the requirements? Thank you. This is very informative and interesting. I am planning to get PR too, I got a Condo investment in manila. PR definitely hassle free. From start to finish, the story you narrated is really good. It’s really a good approach to telling about the permanent resident visa . Hi!thank you for sharing your experience. I just want to ask if they also get your fingerprints or picture? Thanks! Hi Rio. Yes, you need to do the biometrics. Hi to every one, just tough to share my experiences with Manila and 13A visa, I did not think it was going to be so simple just like ABC. I got there on 3rd Jan 2018 early morning had breakfast with Wife and our Little boy that is 2 years old, when they opened first stop was at Receiving Counter ground floor ahead from the Doors, they looked trough paper work quickly, put our name on a list and we have been fist to be called in for formal interview, maybe with Commissioner not sure there, he again went trough all paper work and approved and sign them, he asked us to go to window 18, again they checked every thing that is in folder, he asked us to got to window 17 again the same checked every thing and asked us to go to window 15, this is where we payed 11500php for 13A visa and ACI card, from there they ask us to go to window 20, again with folder and receipt that we payed every thing, here we got date for hearing and which is 8th Jan and Implementation date 15th jan, that is all it took all up 1.5 hrs, but we stayed in Manila at Mall of Asia. HI, my wife and I are currently college students being supported by parents. My parents have been sending me 40,000~45,000 php monthly for my living cost and I kept passbook and bank record of my BDO account for last 2 years. I wonder if those will be enough for my financial proof. Or would it be better for me to borrow $ 10,000~20,000 from my parents just to acquire a bank statement showing that I am not financially lacking. I just think that acquiring my bank statement from my bank back in home country, having them translated and notarized will be a lot of hassle. Good day! Thank you for this it helps me a lot, my husband is American and we are trying for him to get a permanent visa here in Philippines. Does they need bank certificate as proof of financial capacity? If so how much? Hope u can response asap need to know it. Thank you. Hi. I just want to know how long it took you to get your acr from the time of interview? Thanks ! Charlie, I think it depends, usually if the visa stamping is ready then you can collect the ACR card the same day. Shao Kao Grillery - "Tasty Bits of Heaven on a Stick"
Our Verdict on the McDonald’s McRib: WORTH IT or NAH?